Louis Stokes played a pivotal role in the quest for civil rights, equality and social and economic justice throughout his tenure in the United States Congress. Mr. Stokes was educated in the Cleveland Public Schools, graduating from Central High School. Following three years of service in the United States Army, he returned to Cleveland and attended Western Reserve University. He earned his Doctor of Laws Degree from Cleveland Marshall Law School in 1953. Prior to serving in Congress, Mr. Stokes practiced law for 14 years and was one of the founders of Stokes, Character, Terry, Perry, Whitehead, Young and Davidson law firm. As a practicing lawyer, Mr. Stokes participated in three cases in the United States Supreme Court, including arguing the landmark “stop and frisk” case of Terry v. Ohio. On November 6, 1968, Mr. Stokes was elected to the United States Congress and became the first African American member of Congress from the State of Ohio. He served 15 consecutive terms in the U.S. House of Representatives, ranking 11th overall in House seniority. During his tenure in Congress, Mr. Stokes chaired several important committees, including, most notably, the House Select Committee on Assassinations, the Ethics Committee, the House Intelligence Committee, and the Appropriations Subcommittee on Veterans Affairs, HUD and Independent Agencies. He was the dean of the Ohio Congressional Delegation, a founding member of the Congressional Black Caucus, and he served on the House Select Committee to Investigate Covert Arms Transactions with Iran. His work in the area of health led to his appointment as a member of the Pepper Commission on Comprehensive Health Care, and he was the founder and chairman of the Congressional Black Caucus Health Braintrust. When Mr. Stokes retired, he became the first African American in the history of the U.S. Congress to retire having completed 30 years in office. Following his service in Congress, he became senior counsel at Squire, Sanders & Dempsey L.L.P., a global law firm, and senior visiting scholar at the Mandel School of Applied Social Sciences, Case Western Reserve University. He has been appointed to serve as vice chairman of the PEW Environmental Health Commission at the Johns Hopkins School of Public Health and was appointed by former Health and Human Services Secretary Donna E. Shalala as chairman of the Advisory Committee on Minority Health. Through the years, Mr. Stokes has received numerous awards and honors that recognize his national leadership and strong commitment to public service. A number of landmarks around the city now bear his name. Several institutions, including Howard University in Washington, D.C., and the National Institutes of Health, have recognized Mr. Stokes by naming certain buildings on their campuses after him. He is the recipient of 26 honorary doctorate degrees from colleges and universities across the nation. 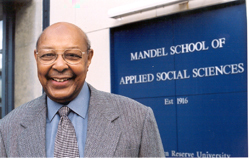 This site is maintained by Louis Stokes Alliance for Minority Participation. To report problems or comments with this site, please contact lsamp@fullerton.edu.